Kataezome author. He is an author full of individual character, devoted to devloping his own original dyeing expression with sharpness and warmth while making good use of dyeing techniques handed down from the old days in Japan. 1970 He won the Tomimoto prize at the 25th Shinshokai. 1997 He won a memorial prize at the 20th exhibition of Kyoto crafts artist association He has also won many other prizes. 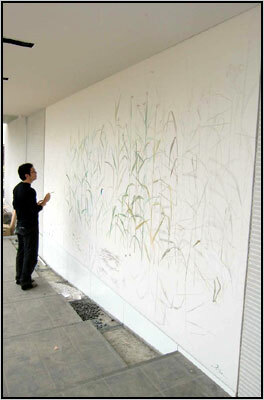 He is a regular participant in Japanese traditional art crafts, a member of Shinshokai, and chief of Isamonyo kenkyujo. 1965 Born on December 12 as the first son of Kunio Isa,a artist of stencil dyeing and Haruko Isa.1985 Started study of Japanese style painting of KANAZAWA COLLEGE OF ART.